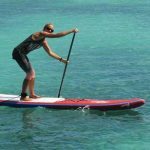 From Jan14th to 16th the world’s first indoor Stand Up Paddle Race took place in London. A race on 12″6 boards, in a 120m x 30m indoor Pool, that was a challenge for both athletes and those organizing the event. 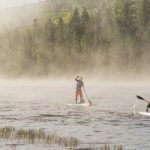 The event organizers had to find a mode to bring the new sport alive to a novice audience in a fun and action-packed way. Paddlers had to be very skilful to make quick turns in the narrow Pool. Hundreds of spectators at the Excel in London saw fast paced man on man races with many more thousands watching online via the webcast. A fantastic weekend of hard fought battles ended with John Hibbard’s overall win in the men’s, and Annabel Anderson’s overall win for the women’s. We could not agree more. What a weekend! After the race, we had a blast with Annabel, shooting the videos for the SUP fitness section. We started in the changing room and then moved up to the media center. Not ideal setting, but very authentic! All Fotos are (c) Petra Offermanns | www.sup-guide.com. 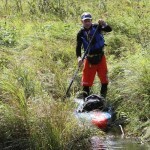 Please drop us a mail under info(at)sup-guide.com if you would like to use them! Thanks!